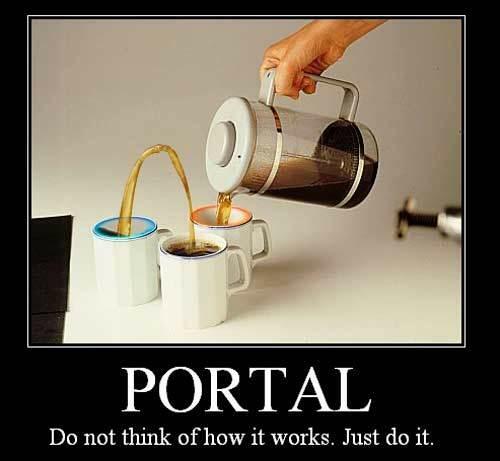 Portal – Do not think of how it works. Just do it. Anything Portal is automatic win. Coffee makes it even better. Wow… that’s just utterly pointless enough to work. Epic win! You know, this was a Triumph, I should make a note here. Perhaps, huge sucess? I’m laughing, but I don’t even get it. Actually, I don’t think there is anything to get. Maybe that’s what’s funny about it. I love portal so hard 🙂 Ending song was the greatest. if you don’t get it, get portal. NAO. Next thing, I’d like to see in portal 2? Time displacement portals.